Around 66% of employees regularly or occasionally have to work alone according to research by the communications business Daisy Group Ltd. However, nearly 20% feel their employers don’t do a good job of monitoring the welfare of lone workers. More worrying still, one-in-six lone workers think it would take their colleagues at least seven hours to notice if they went missing. With an estimated six million lone workers in the UK, it is vital that employers and employees work together to minimise the risks associated with working alone. Directors have clear legal obligations to conduct risk assessments and set the rules and procedures for ensuring employee health and safety. However, employees also have a responsibility to follow those rules and watch out for their colleagues. The question is how can you look after the wellbeing of an increasingly mobile workforce? And how do you do it in a manner that feels more like best buddy than big brother? After all, few people like to be micro-managed – it can feel intrusive and lower morale, which may make it hard for you to retain talent. Perhaps the most obvious place to start is with a detailed risk assessment to identify all employees who may have to work alone and the risks they could face. Once you have this you can look at practical procedures for ensuring their safety and responding in an emergency if those procedures fail. For instance, you could set up a simple system of check-ins at pre-arranged times – either in person at an agreed location or remote by phone or text message. These procedures need to include clear guidance on what to do if an employee misses a check-in. How do you account for them simply forgetting or having technical problems? You don’t want to be calling the emergency services simply because someone is in a mobile ‘not-spot’. However, while it’s good to talk, phone calls and texts are not always the most efficient way of keeping track of people. There are an increasing number of high tech solutions but many of them seem quite cumbersome, which puts workers off using them. What if there was an easier way: one that felt intuitive not intrusive, one that made your employees feel both safe and valued but not spied upon? Here at Safepoint, we are developing just such a digital management system. Our focus is on simplicity and elegance of design that creates a pleasant user experience. We want it to feel friendly, even playful, but with a serious purpose, so workers actually want to use it. It's also straightforward for any company of any size to set up – you don't need to be a technical wizard. Simply contact us for access to our beta programme. After entering a few basic details, you will have access to our intuitive guardian portal. Then you'll be able to start creating teams and inviting workers to join. 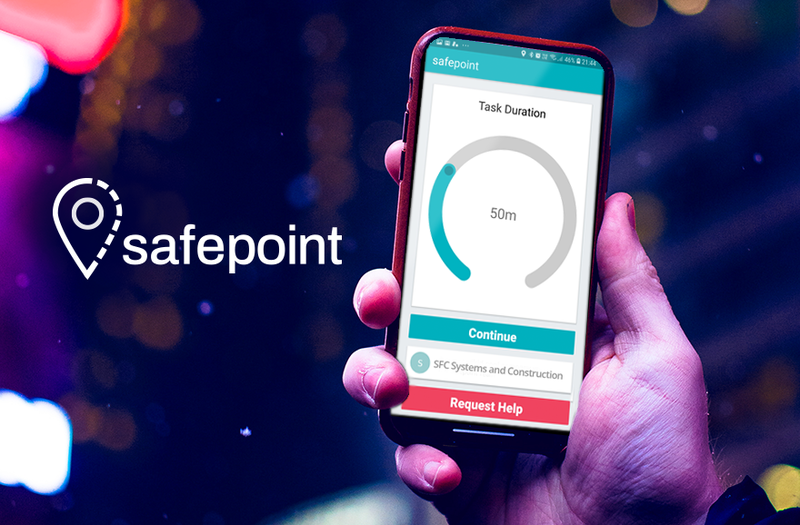 All your workers have to do is download the Safepoint App to their iPhone or Android device and simply accept your invitation. Our transparent monthly subscription model makes it cost effective to add additional team members or devices for a set price. Now you and your team are ready to go. All your lone workers have to do is enter a job name and duration – this will create a task. Once started, the app runs unobtrusively in the background. Our guardian portal allows you, or allocated team members, to track active tasks from start to completion. GPS Location, task duration, phone signal, battery level and other important information are all visible and updated in real time. The system also provides you with a clear audit trail of all tasks started and completed. Most importantly, it alerts you if a lone worker fails to notify you that they are safe and well at the end of each task. If you would like to trial our beta version sign up here and we will get in touch. What are my health and safety rights and responsibilities as a lone worker?